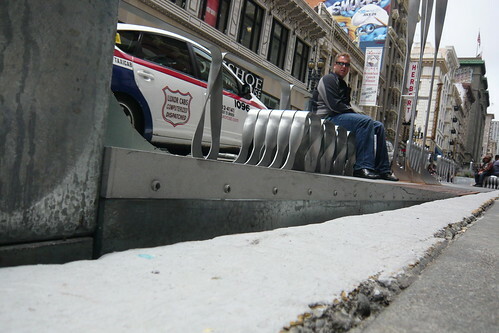 If you've been on Powell Street lately, you might have noticed the new parklets just south of Geary. This has made it able to expand the sidewalk to ease overcrowding while eliminating most parking spaces. I'm impressed, San Francisco government, you can do something quite interesting. It's a little disappointing they couldn't expand the sidewalk to cover the entire block; instead, there are still some parallel parking gaps, but it's only for active loading zones, such as the one in front of DSW, and others in front of hotels. The way it's made is very interesting, there's plants, places to sit, high top tables, and extra space to walk around without that Times Square feeling of being crushed while walking. Even more interesting is the solar panels, but I'm not sure what they do. Here's some odd observations from the use of the parklets... 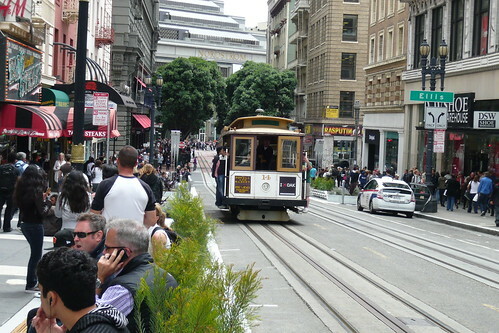 I've noticed Cable Car passengers waiting at O'Farrell lining up for the Cable Car because of the way the parklet was built near that corner. Um... there's no such thing as a line, unless if you are at a turnaround. While I do love these gorgeous piece of works, there's some things they really need to fix. The above photo is a perfect example. The edge of the parklet is supposed to be level with the height of the curb. In this shot at the northeast corner of Powell and Ellis, this particular parklet is not even with the curb (about four inches at its highest point). That's a definite tripping hazard. A second hazard as seen in this photo is where you see the brown slabs of wood and the metal parts sticking out. This particular piece is where the solar panels are attached to, but why are the metal parts just sticking out like that? I know it's all about looking futuristic and such, but what will it cost the city in lawsuits? 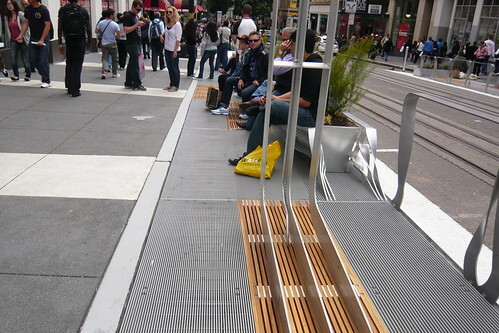 Lastly, there's also some gaps within the parklets where the safety barrier meets the road. While I don't have a picture of it, those gaps within the parklets has been encouraging people to jaywalk across the street where they encounter no gap on the other side's parklet. 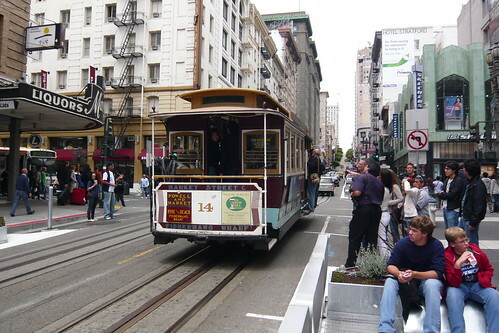 It also encourages cars to double park and let passengers off in those gaps, and that means holding-up city traffic and the Cable Cars. Hopefully the city is reading this and can get the contractors to make some necessary corrections so we have happy tourists willing to come back to the city, instead of injured tourists thinking of visiting somewhere else next time. I noticed these a week back when I watched the construction taking place. It will only be a matter of time before the homeless take over those parklets and turn them into a stinking mess. I like reading Akit's Blog it's great reading material even if he is bashing me sometimes...... LOL Keep up the good work!!!! Those Parklets are going to require close monitoring if they are going to work and they should not be used as ashtrays! Tell Caltrain: No More 8-Ride Tickets on Clipper! What's the Hurry on the Upper Great Highway?